The free version does not expire but will stop supporting some of the additional features in the plus edition after 14 days. 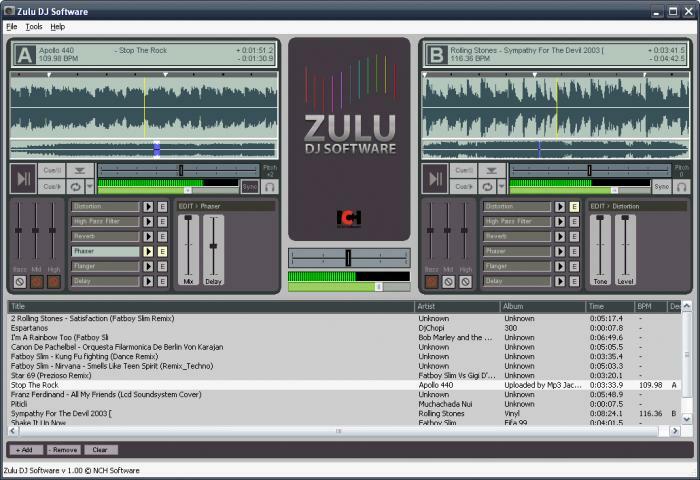 Zulu is a audio DJ program for Windows. This professional DJ software lets you mix music and other audio recordings live. When loading a music track onto a deck Zulu will automatically scan the file for a beat and assign a beat per minute (BPM), and will change the tempo in the second deck for perfect synchronization. Drag and drop music into and around the application's interface and preview an upcoming track through headphones via a secondary audio output. Crossfade in between two tracks. Change the pitch in real time of each track, slow it down or speed it up to manually sync it with the other tracks. Tap tempo, tap space bar in time with the beat to obtain the correct BPM for a track. Manual edit of BPM, input your own BPM value if you think Zulu may have scanned it incorrectly. Hot Key control so you can assign any key or key combination to the buttons and switches on Zulu for faster use. Add a cue pointer marker at any point in a track to instantly start playing the track from that point. Loop sections within a track and syncronize that loop to the BPM. Real time Equalisation on each Deck (track) including "kill" buttons for instant EQ. Apply effects in real-time to a track. Effects include Distortion, High Pass Filter, Reverb, Phaser, Flanger and Delay. Separate output for Professional DJ Headphones. Simple and intuitive user interface for day-to-day operation. Bugfix for cursor jumping forward when increasing the loop length during playback. llib to add additional diagnostics (asserts, LDEBUG, ponter tests etc) for the bug "Crash on seeking file in ASIO". New test plan to detect the bug "Deck and samples stop playing". Bugfix for cue Marks working improperly after using Loop feature. Bugfix for only first Cue Mark can be dragged. Bugfix for cue Mark not popping on Beat points of Wave Form. Done create a Suggestion for the product to add a new test plan to detect the bug "Beat loop not shown when applied while deck is paused". Bugfix for in pause mode, when activating a loop through loop menu button or shortcut key, the loop starts in a wrong position. Improve textbox label: "Track can be fed to separate deck"
Allow loading samples to Sample Bank from NCH Sound Library. Changed play sample function needs to allow the sample to play whether the track is playing or not. Fixed cue pause deck A slider skips instantly to the cue point and plays the track again. Fixed edit BPM displayed as "Unknown"
Fixed when playing preview waveform is displayed partially. Fixed when user click on cue pause Deck A in auto play mode then slider skips instantly to the cue point and plays the track again. Fixed Pause button looks bad, it ruffles in eyes. Posted by Anonymous on Fri, 05/29/2009 - 13:08. Yes, it's terrible. Pressing the Sync button makes the playback of the playing song jump. Not to mention all the adds it puts in your start menu and that everytime you close the program it will take you the homepage of the program. Posted by Anonymous on Mon, 03/30/2009 - 19:35. Great mixer..except sometimes lost tracks from the playlist. Also, when loading tracks onto one deck, the other deck stopped playing. AND sometimes played the wrong track from the playlist.